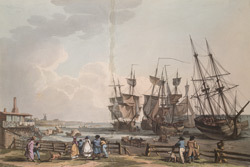 Margate became a popular resort for the English nobility in the late 18th century. Fashionable people came to follow the new trend of sea-bathing as a health restorative. These tourists generally preferred to stay in houses built inland for the parade. Margate Pier was rebuilt in 1789 but later damaged by a storm. The harbour was not fully developed until it was renovated by John Rennie in 1810.